AFPG804 for Panasonic / Nais FP-Sigma and FP-e and other PLC controllers. AFPG804 for Panasonic / Nais FP-Sigma and FP-e PLC controllers. Height: 2.5 mm. Diameter: 20 mm. Replaces: Battery AFPG804 for Panasonic / Nais FP-Sigma and FP-e series controllers. This AFPG804 Lithium PLC controller battery fits several Panasonic / Nais FP-Sigma and FP-e and other PLC controllers. 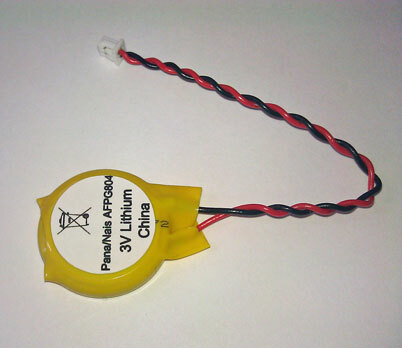 It is a DIRECT replacement for the AFPG804 and AFPG804J battery. Panasonic / Nais AFPG804 - Backup battery 3.0V (compatible) AFPG804 Lithium CR2025. This Panasonic / Nais AFPG804 PLC battery comes with a one year manufacturer's warranty.